Yoga has many health benefits as we know; the mind body connection, it builds strength, increases the flexibility and vitality, decreases stress and many more amazing benefits. What isn't talked about is the sometimes very uncomfortable moments during the pose. There is a reason that over 20 million people in the US alone are now practicing yoga. It works. But we need to stay within those uncomfortable moments and BREATHE. This is when the magic happens. STAY WITH IT BEN, STAY WITH IT. Being uncomfortable in yoga is the point. This is how we learn our reactions and develop awareness about how we engage in the world. Be forewarned however, you can feel so good after yoga that when you head to the pub you may just find yourself dancing on the tables later. It happens, I know this first hand. If you knees are higher then your hips, sit up higher on a yoga block, a book, a blanket, whatever you can place under your hip bones, (sitting on someone else, not a good idea). The girl in the back ground makes this photo. Notice the relief as you sit up higher. Place your hands on your legs, lengthen your spine, draw your shoulders back and keep breathing. Let gravity draw the weight of the sit-bones down. Notice when you feel uncomfortable. Try to breathe through it. Notice the aches in your body. BREATHE THROUGH IT. Calm your mind and begin to still your thoughts. BREATHE THROUGH IT. Of course, if your knees are screaming, that of course, is bad pain. Pain is not necessarily a gain in poses like this, but try to deepen your breath and send the breath into those uncomfortable places. Find relief yet? Keep breathing. This pose would be a five minute hold, but for a beginner, try to stay in the pose for 5 rounds of breath which includes the exhale. 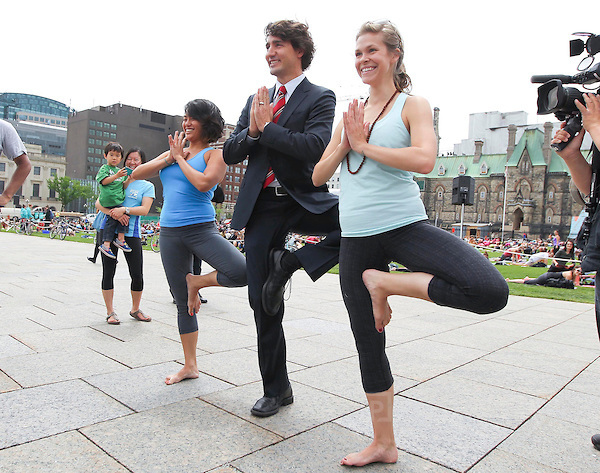 To inspire you today, here is the Prime Minister of Canada being a tree! STAY WITH IT BEN, STAY WITH IT. I need you to keep practicing so you can come teach at my classes and be my side-kick. I need a side-kick too. Remember to keep breathing, keep practicing, listen to your body and have fun. Alternatively, you can actually hire a professional (like me) who can set you right. Monday's pose will be much much easier so have a great week-end! Newer PostA little ritual, some mystery and a whole lotta of intention.